What these readings told me was 1- the relay was good and the furnace had power (the initial high amperage reading was the heating element in the relay heating up), the second amperage jump (after the blower came up to speed) told me that the limit switch and sail switch were both OK, and power was getting through to the circuit board, the last amperage jump told me that the gas valve was getting power, and the circuit board was opening it. (A side point is that the final amperage reading- 1 amp- is the setting that the “anticipator” should be set at on mechanical thermostats). This might be something to try but might not work well if you have fan control in your furnace control board. Getting poor or misleading information can be expensive or even hazardous. There are several RV topics that seem to suffer a disease of misinformation. You can often tell what these are because they generate long and heated discussions on forums such as at Open Roads Forum or Airstream Trailers & Airstream Motorhomes Forums! Even publications cannot be trusted. The Blue Beret recently took on weight ratings and Highways got going on tire pressure. How can you figure out what to believe? Here are a few ideas to help you figure out what you can learn and what you should use. Be a skeptic. Don’t take anything for granted no matter the source. Look for the underlying concept behind a rule, a guideline, or a specification. Try to learn the why as well as the what. Watch out for logical falsities. The ‘excluded middle’ often shows when people talk safe or not safe, for instance. A List Of Fallacious Arguments can provide other ideas of what to look for in how people present their ideas to help you evaluate how good those ideas really are. Keep in mind that there are no guarantees. When it comes to things technical like tire pressures, weight ratings, and sway control there are many factors involved and a simple answer is very likely to be an incomplete answer. The December 2006 Newsletter has been posted. * Read about some of the things that make the SNU unique, meet our newest members, read about Don and MaryLou Damoth’s stay in Key West. * Be sure to provide your input on the the SNU newsletter, the proposed amendment by Region 12, and other issues. The form is in the newsletter or you can go to this URL for an html version. This page also provides a link to the SNU Operational Notes, including the Fiscal Notes which are provided in part in this issue of the newsletter. >> Plan to attend the SNU December 16 luncheon < < The site for our December 16, 2006 luncheon, the Overland Hotel in Fallon is on the Nevada Register of Historic Places. It is a Basque restaurant near the intersection of US 50 and US 95 in downtown Fallon. All members & guests are welcome. Cost: $15 per person. Time: 11:30 am The Overland website provides directions and information. SNU member Mike Orchard is the discussion group leader and has helped get this set up. It is another avenue of communications for SNU members. New RVer – Beginner’s guide to RVing is more than just for beginners. They have some good stuff even for the seasoned and experienced RV enthusiast. For instance Silicone Cookware — An RVers Dream Product provides a good rundown on this new type of oven ware – and a link to purchase at the end of the article from Camping World. Rallies and Caravans and RV Shows provides a definition for the newbie – that refers to a book you can buy. Practice takes the stress out of RV driving has some good ideas. The final set of driving skills you’ll need to develop are for safe highway driving. These include passing, negotiating curves and grades, and managing your speed to meet conditions. You will be moving a lot of weight down the road, and it will take longer to crank it up and slow it down. Save steep mountain roads for later trips — start out with something easy. Get the feel of your brakes and how your rig handles curves. Take it slow and steady as you start out. Try to arrange for practice drives on quiet weekdays. The Articles & Opinion section has some interesting columns. One considers the idea of an RV shower, like in a baby or wedding shower. Then there is the diesel or gas question or why RV and camping can be different. The RV News & RV Articles section has an RSS feed, too! How hot is your turkey? The day approaches when many turkeys will be filling ovens and other hot places on their way to the table. There are reasons for this. One is that cooking the meat makes it taste better. Another is that the process reduces the risk of illness from improperly prepared food. Food for Thought: Birds Don’t Have to Be So Hot, Science News Online, Nov. 25, 2006 reports about a bit of re-thinking about just what temperature goals need to be met for safety. It seems that some folks have been using a microwave to heat poultry dishes and didn’t quite get the dish hot enough. Salmonella is the worry. It is not only in microwave dishes but also the primary potential problem for your Thanksgiving dinner. What it boils down to is that you need to get your bird up to at least 165°F all through to be fully cooked. This is likely to be a bit raw for most folks, though. You will probably want your bird at around 170°F for breast meat and 180°F for thigh meat for best flavor. The old guidelines said you needed 180°F all through for best safety. Now it looks like you have a little leeway so the white meat won’t get quite so dry. There are other things you should do to assure Food Safety – see the Owner’s Guide article and keep your family in good health this Thanksgiving. It’s 50 years old this year. And it was in this very month, November, 1956, that the first eight-mile stretch of what would eventually be more than 42,000 miles of limited access highway lacing the states together was opened in Topeka, Kansas. The column at TCS will bring back many memories of your experienced on your last road trip. You might even be old enough to understand some of his recollections of pre-interstate highway travels. But this Kansas anniversary thing tickles the memory of another anniversary. Isn’t this the centenial of the fly-swatter, an invention that came out of Kansas in 1906? One of those paranoia feeding issues for some folks is Boyle’s Law (or more generally the ideal gas law) applied to tire inflation. The worry is that, because you have to have just the right pressure in your tires, what happens to your tire pressure if you go from the Salton sea to Lake Tahoe? Or, using temperature extremes rather than altitude or pressure, from Death Valley to Tioga Pass? Bridgestone Commercial Truck Tires has a nice rundown on this conundrum. Altitude isn’t much of a problem as that will only cause changes within a few psi and your pressure guage isn’t really good enough to detect that accurately. Temperature can have more of an impact but even then one shouldn’t get obsessive. A temperature change of 100F might make as much as 15psi difference but the tires are designed to handle this in normal use. On the road the tire will flex and heat up. This means the pressure will increase which makes the tire less flexible. That creates a balance point between how hot the tire gets and how much heat it generates. The key is that you should check tire pressures frequently when on the road. The tires should have been out of the sun and resting for several hours before you check the pressure so this usually means before you take off down the road for the day. Don’t try to accomodate for altitude or temperature changes, just get them right for where you are now. Also see the Michelin RV Tire US – They have what they call “Industry approved preventative maintenance procedures to show how to get the most value from your RV Tires” and a nice PDF document about RV tire care. That document gets rather obsessive about loading and tire pressure but that topic is for another entry! The Nevada DOT has implemented a new telephone service for 24×7 road condition information. 511 joins the other 11’s such as 211 for health and human services and 911 for emergencies. The Nevada 511 service is also on the web at Safe Travel USA. The website (see link Nevada 511) provides a map with road work and other driving hazards noted by markers and weather condition restrictions locations. There are links to text reports for Controls, Construction, and Events/Incidents. At the bottom of the page are regional maps for temperature, wind, and weather radar. Safe Travel also hosts sites for some other states mainly in the Montana to Kansas corridor. It is sponsored by Meridian, a weather forecasting service. There has been a lot going on in alternative energy research. Solar cells inch up in efficiency | TG Daily provides a look at some advances you may see not far down the road in solar panels for your RV. Note that the efficiency improvements are limited so be careful about hype you may get from salesmen and advocates. Connections was a BBC TV series about the history of technology. There have been some who tried to follow James Burke’s idea but none has quite succeeded in connecting this invention and need to that to show just how advancements and invention are not isolated aha! moments. This blog has links to fifty minute Mpeg 4 video files for each show in the series. Cambridge in Colour – Digital Photography Tutorials and dg28.com – photographer education are some places to go if you want to learn how to make more effective use of your camera to record your travels. Some have even achieved levels of expertise that they can make a living selling their photography. After you get educated about photography, you can go over to HyperPhysics and learn about optics and other fields in physics. The Biology of B-Movie Monsters is where you go when you want to find out what would happen if you discovered a movie monster in real life. Its where biology and geometry collide! Winter time camping can be invigorating. You have more of a challenge in keeping warm and you have to do something about the water freezing. Keeping warm means not only energy, like in batteries and propane, but also things like condensation. See DANK! for some ideas about keeping your winter abode free from dripping walls. Also take a look at Warmth for some ideas on keeping warm. The water problem surfaces in the matters of hygiene. The PETT portable dry toilet by Phillips Environmental in Canada and their WAG bags are one solution. Some folks get into the home made route with plastic trash bags, kitty litter, and other materials. A macerator pump can be handy for pumping out waste tanks. The discussion at RV.Net Open Roads Forum: Tech Issues: Homemade Macerator Pump discusses making one of your own from a kitchen disposal. Winter is also the wet season. When you get snow on the rig overnight and it melts during the day, you can be sure that every leak will be put into service. RV.Net Open Roads Forum: I used a leaf blower to leak test my RV (with pics) describes a technique for finding leaks. See also the blog entry Finding Leaks. The issue of furnaces and other heating systems is also a big deal. One extensive report discusses the different kinds of heaters, the issues for each, and the alarms that you need to have in your RV. See Catalytic Heaters – on the SKP’s forum – the article has enough links to sources for additional information to keep you going through a long winter’s night, too! BOBISTHEOILGUY is where to go if you need to discuss oil. Forum sections include car and truck lubrication, fuel additives and cleaners, heavy and industrial lubrication, oil analysis reports, science and technology of oil additives, oil and bypass filters, and even lawn equipment. If that’s not enough, try TheDieselStop.Com Forums. There is the answer out there, somewhere. Any long term sit down job, like driving cross country, can leave you feeling it unless you pay attention to good posture. How To Keep Good Posture When In Front Of A Computer at Ririan Project is for those stuck at a desk behind a computer but the same advice applies to those behind the wheel. Look around and don’t sit still. All good ideas to keep in mind so you can enjoy what you are doing, drive safe, and not suffer at the end of the drive. Fankhauser’s Cheese Page might be a source of information if you wonder about cheese, or making your own. I have been making cheese since the early 1970s when my wife, Jill and I began “homesteading” on a little farm in SW Ohio. We were interested in achieving as much self-sufficiency as feasible in the late 20th century. Our activities have included keeping a herd of dairy goats. As a result, we have performed countless experiments making various cheeses, yogurt and other milk products. I teach some of these techniques in my biology labs at the University of Cincinnati Clermont College. In participating in Cheesemaker’s Discussion Boards over the years, I have seen many of the same questions arising over and over. To answer the recurring questions, I have put together a collection of my recipes, protocols and suggestions for making and using these various milk products. A biology professor should have an interesting insight into this topic! Are reservations why attendance is down? The National Parks seem to be having a slump in attendance these days. Maybe the need to reserve a campsite is scaring folks away from them. Don’t let it keep you away. See the US National Parks Reservation Service to make your reservations. Now is the time to start getting next summer’s camping and touring season tied down. Now that all the leaves have fallen off the trees, you can take time to learn why fall can be such a colorful season. Check out LiveScience.com – Fall Foliage: Why Leaves Change Color. Find out why the reds remain a bit of a mystery. Worried about awnings unfurling en route? One of the things you probably don’t want to do is to set up a sail when going down the highway. The RV Awnings can unroll if a gust gets to it just right even if the main tube is held close to the rig. So the need is to make sure it won’t unroll. Most Zip Dee awnings have a hook for this but you may need another fastener. There is a good discussion on this topic over at RV.NET – General RVing Issues: Unfurling Awnings While Driving. One of the solutions is LOESS HILLS INNOVATIONS INC. with some good information about the potential problem. Coil n Wrap RV Products Camping Product RV Awning is another resource that has other interesting stuff for the RV enthusiast. If you are one of those efficient types and are starting to look for gifts for the holidays, Here are some links to Airstream related stuff that might fit the bill. First – Don’t forget the SNU insulated travel mugs. A $10 donation per mug us a great way to support the SNU. See the home page. * These sheets were mentioned on AirstreamForums.com. They are flannel sheets with pink flamingos and Airstream trailers. What more could you want! 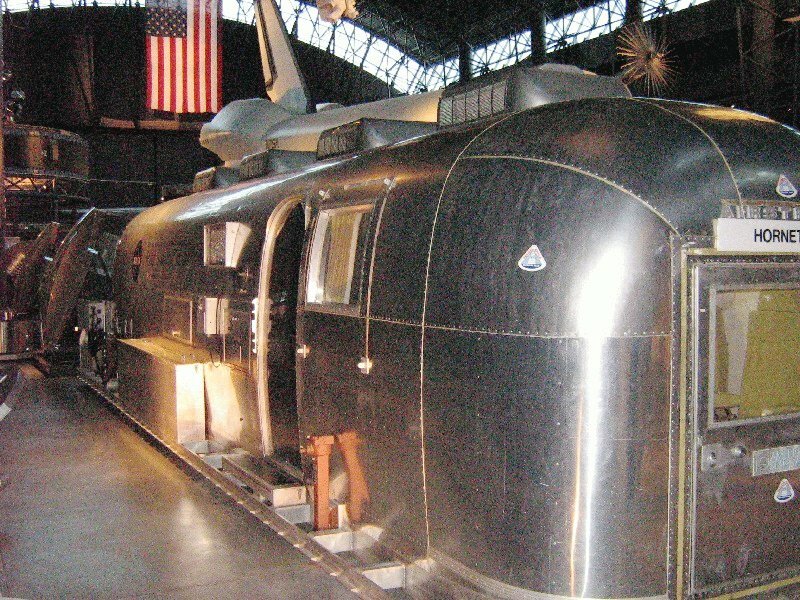 * Airstream.com has an assortment of Airstream related items. * Need an Airstream birdhouse? * A subscription to Airstream Life magazine might be just the ticket. * What about a die cast model of an Airstream trailer? E-Bay is another resource, especially if you are creative with key search words. But please do keep in mind Caveat Emptor! Always be careful when choosing vendors and purchasing things, especially online. E-Bay, Amazon, Vintage Trailer Supply and most others referenced here are reliable vendors but that does not mean appropriate precautions should not be taken. Its bad enough that the furnace is a vampire for battery juice and propane. Every now and then it gets to where it likes to keep you up at night by a continual screeching and howling. This is usually an indication that the motor is getting lonely and its bearings dry. The solution that problem is usually replacing the motor. 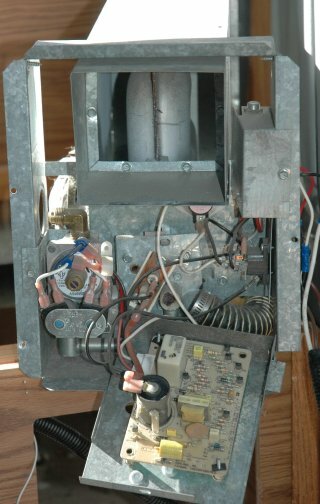 Here’s one story on the process involved with a B-Van furnace. November 7 is vote day. Here are some resources to help you make decisions. From the ads and mud slinging and money spent, it appears that there is a lot invested in this election. Make your vote count and make sure your reasons for voting are well founded.